The ‘Gun Tavern’, just to the south of the church, was purchased by the Board of Ordnance in order to provide a site for a Catholic school. The ‘Gun’ moved to a new site and the land was given to the church. 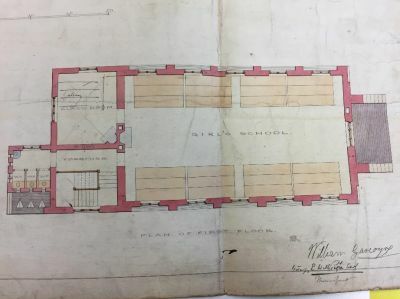 Plans were drawn for the new school by Mr. Pugin’s son, Edward Welby Pugin. This illustration shows a plan for the first floor of the school, clearly signed at the bottom by Mr Pugin.